Class 9 Label (Miscellaneous Label) Buy Securely Online! The EU has passed numerous directives and regulations to help keep people safe when using and transporting potentially hazardous substances. 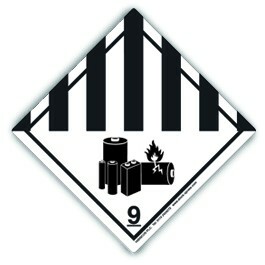 The Class 9 label is used for the transportation of substances and articles that are not covered by the other classes. 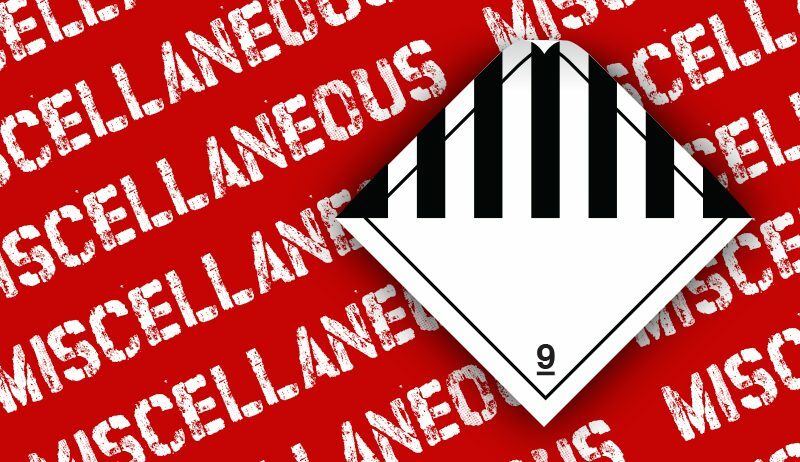 WHAT ARE CLASS 9 Dangerous Goods? Miscellaneous dangerous goods can pose a wide variety of potential hazards to human health and safety, infrastructure and their means of transport. Commonly transported Miscellaneous Dangerous Goods include: dry ice, expandable polymeric beads, ammonium nitrate fertilizers, blue asbestos, magnetized material and air bag modules. The Class 9 label for packages must be at least 100 x 100mm, from edge to edge, and set at an angle of 45°. The label must show a dotted outer boundary line (unless it is being applied on a background of contrasting colour). The class number ‘9’ must be shown in the bottom corner and be in text at least 12mm high. 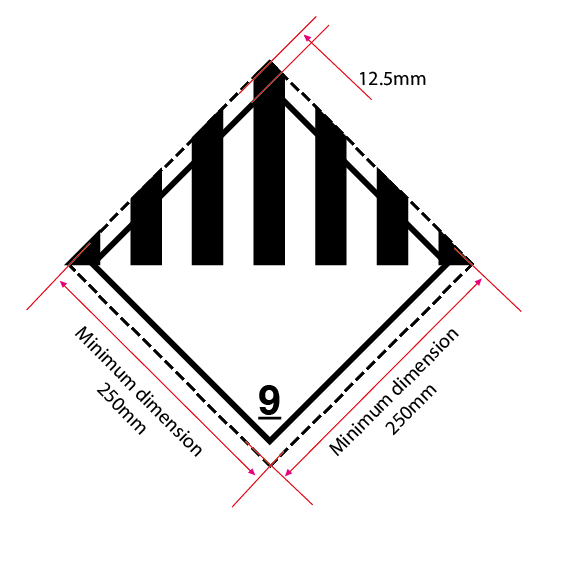 The inner black line of the Class 9 label must be at least two millimetres thick and there must be a gap of 5mm between this and the outer dotted border or the outer edge of the label. The upper half of the label must contain seven vertical stripes. Lithium batteries that do not qualify for the exceptions (under Section IB, or II of Packing Instructions 965, 966, 967, 968, 969, or 970) must be shipped as Class 9 dangerous goods and meet extensive requirements. The provisions on additional text on hazard labels have been revised to identify that for the new Class 9 – Lithium Battery hazard label the only information permitted in the bottom half of the label is a pictogram and the class number. The new hazard label came into effect on 1st January, 2017 and has a 2-year transitional period. The Class 9 placard is used for cargo transport units such as freight containers and road/rail tanker vehicles. Class 9 placards must be at least 250mm x 250mm, from edge to edge, and set at an angle of 45°. The placard must show a dotted outer boundary line (unless it is being applied on a background of contrasting colour). The class number ‘9’ must be shown in the bottom corner and be in text at least 25mm high. There is no specification for the thickness of the inner line, as yet, but there must be a gap of 12.5mm between this and the outer dotted border or the outer edge of the label. The upper half of the label must contain seven vertical stripes. All of the Miscellaneous Labels and Class 9 placards manufactured by Stock-Xpress comply with IATA/ ICAO, UN ADR/RID and IMDG/IMO requirements, and are made from materials that meet the strict BS5609 standard. BS5609 is a specification for labels that are intended for marine use, whereby both the ink and the substrate must be able to withstand 3 months continuous immersion in sea water and still be legible and have good adhesion. We manufacture the Class 9 label at 101 x 101mm on rolls of 250, and as single cut labels at 100x100mm. Class 9 placards, for use in international transportation, are supplied at 250x250mm and 200x200mm for UK transport only.